Jacob: Be better than the Gap. Well, I’ll give them “crazy” and “stupid” but that’s pretty much where the love stops for me. CRAZY STUPID LOVE is yet another romantic comedy that gets lost in all the crazy highs and stupid lows we have all come to associate with that elusive and all-encompassing emotion we call love. And while love certainly causes all of us to exercise poor judgment from time to time without question, a good chunk of us still crave its complexity regardless. We’ve all certainly been there but hopefully when we were there, we were nowhere near as pathetic as this ensemble comedy is. 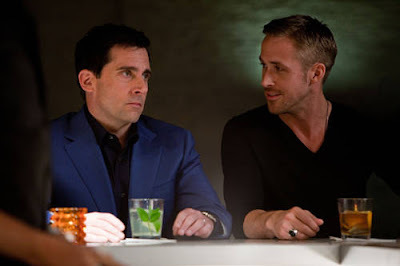 CRAZY STUPID LOVE is the second directorial effort from duo, Glenn Ficarra and John Requa (I LOVE YOU PHILIP MORRIS), and even though two heads should be better than one, you would think no one was in charge from how aimless and tired this plot plays out. Their choices, whey they actually make some, are simple enough for any love struck idiot to understand. We know from the moment the film starts that the love is gone for Cal and Emily (Steve Carell and Julianne Moore) by what they’re wearing on their feet. Everyone at the restaurant is playing footsie under the table with their fancy footwear except for these two. Cal is wearing running shoes so we know that he’s given up trying. He also drinks from a straw and his wife does the driving so we know he’s a sad man. At one point, they end up in an argument in a school parking lot, shortly after it looks like they might reconcile no less, and it begins to rain down heavily on Carell after Moore walks away from him dramatically. “What a cliche,” he exclaims and I could not have agreed any more. After Cal and Emily separate at the beginning of the film, Cal tries to get back out there. This is where he meets Jacob (Ryan Gosling), a smooth operator, who for some inexplicable reason, takes pity on Cal and decides to help him become a real man. Of course, becoming a man people can respect means buying into a world of materialism and detachment, two paths that certainly do not lead to love. As fantastic as it is to watch Gosling let loose for a change, it is clear from the start that ultimately it will be his womanizing ways that will need adjusting in order for him to find true happiness, especially if he intends to land the beautiful Hannah (Emma Stone). And as if there weren’t enough tumultuous sub-plots intersecting already, screenwriter, Dan Fogelman (TANGLED), gives us a few more love conundrums to ponder involving a babysitter with an inappropriate crush, a 13-year-old lovesick boy and Kevin Bacon. The point is to distract and make us laugh but all it does is weight the whole project down with heavy awkwardness. I will not pretend to know too much about love. It seems to me it comes in many different forms and we can only know what it does to us as individuals when we’re in it. I can say that my experience has been that it is a transformative emotion well worth every pain that comes with it. It is tricky enough to navigate in the real world though and hard to take seriously in a world as contrived as the one created in CRAZY STUPID LOVE. While Ficarra and Requa attempt to convey how our modern society has made it even more difficult to find love and hold on to it once we have it, they still hold true to the archaic notion that we all have one perfect partner, a “soul mate” if you will, waiting out there for us to find. As far as love in the present day goes, that notion is about as stupid and crazy as they come.